Samsung's all-new Exynos 9810 chipset just became official, setting its sights straight to the upcoming Galaxy S9 and S9+. Well, at least in certain regions. With four high-performance cores clocked at up to 2.9GHz and accompanied by another quad-cluster of efficient cores that will go easy on your battery, a super-speedy Cat.18 LTE modem that enables downlink speeds of up to 1.2Gbps and 200Mbps of uplink, neural network-based deep learning, and probably most importantly, "real-time out-of-focus photography in high resolution and brighter pictures in low light with reduced noise and motion blur", the Exynos 9810 is forming to be a beastly silicon. But how does it fare against the elephant in the room, Qualcomm's Snapdragon 845 chipset, which will be powering the US-bound version of the Galaxy S9 and S9+? That one is also packing some serious horsepower, snappy LTE speeds, and all the bell and whistles to propel the Galaxies just as good as the Exynos chip, but there's always going to be marginal disparity in performance and battery life, with Samsung's own chipset traditionally being slightly ahead. Let's compare how these two chips measure up against one another in a neat table that should really put things into perspective. 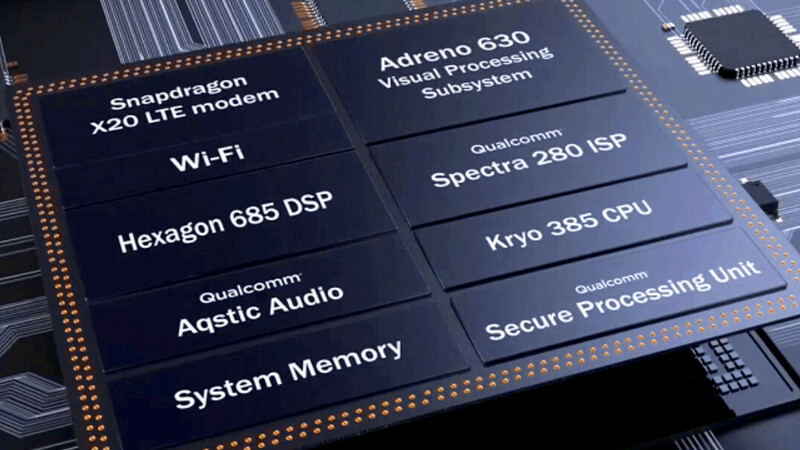 Sadly, the white paper for the Exynos 9810 has not been released yet, so we don't know just about everything we want to regarding the chipset, but rest assured we will update the table above with any new data that becomes clear. Peter K. the SD 845 can record live camera HDR 4k 60 fps. I don't see anyone else offering live 4k HDR capture. Everyone else is doing HDR post production on videos and images. Think about it, the SD 845 is fast enough that it is doing HDR on every 4k (3840x2160) frame, times that by 60 frames every second. That is a lot of processing for a live video feed. I am sure that the SD 845 can record faster than 60 fps if you forget about the HDR part. Thanks for the info, sgodsell. HDR video is just 10-bit video in a different color space from an encoder's perspective. Since the Exynos can also record 4k 10-bit 60 fps, it should also be able to encode it. However, I really really doubt it's useful since the camera sensors on phones are too small to capture that much dynamic range anyway. What the hell are you talking about? The high dynamic range (HDR) is adjusting the colors live on each frame. Clearly you don't know what HDR is. Also Sony has image sensors now that support HDR. Get up to speed man. Also if the Exynos could support live HDR, wouldn't you think Samsung would have listed that? Only the SD 845 can do that right now. Nobody else offers live 4k HDR 60 fps video. The per-frame basis is only for Dolby Vision, not HDR10. I don't see Sony image sensors with live HDR though, not keeping up to speed on that one, so might already be here. Let's see if any phone has HDR video recording at 4k60 this year. My guess is no. You must enjoy embarrassing yourself, or your trying to look like an idiot. Especially when Sony's camera sensors in smartphones (Exmor RS) since 2015 supported 4k HDR at 30 fps. Their latest is at 60 fps HDR. You could have saved yourself the embarrassing post if you would have done a web search. Do you know how to search the web? They have courses on that. I already said I have no idea what sensors are capable of done I don't keep track of them. There's nothing embarrassing slot that, unless your life depends on internet debates lol. Oh look, who is saying this. You yourself didn't have the motivation to post a proof and among others to do a search. Try to be a little more respectful. We are adults here, not kids on call of duty. The Galaxy S7 (Exynos 8890) and S8, Note8... can already record live HDR 4K 30 FPS in HEVC, when rooted. I assume that the new Exynos will be able to record HDR 4K at 60 FPS without any issue. It's even likely that previous Exynos processors can already do it, but that the cameras in these smartphones don't support it. The wonders of using the same term on similar technologies. HDR on photography and HDR on video isn't the same thing. Video HDR is a shift to 10 bit depth, with its massively added colour and contrast detail as a selling point. HDR on photography is a post processing feature to (hopefully) get all the good aspects of combining multiple images with various exposure levels into one. 120fps 4k video recording by the Exynos!!!! BEAST MODE!! Anybody know why Samsung doesn’t just put the Exynos in all their phones? I believe because of having to pay licensing fees for the CDMA radios from Qualcomm if they want to include it in their SOC. you are wrong. s845 made by samsung. if ss no use it. nothing to made. galaxy s6 use all exynos for cdma verizon and gsm. It is cheaper to use SD in EUA than paying royalties. Qualcomm is abusing its patents. That's why its getting sued left and right. They aren't. When you offer the best technology, you have a right to charge what you feel its worth. As with any other product, you have alternatives. Intels modems are inferior vs Qualcomm as they have only achieve 600mps while Qualcomm achieves 1.2Gps. More performance means more money and cost. Apple signed an agreement. Of they didn't like the price, they coudl have had Intel make 100% of the modems they needed at a lower cost. Apple who charges as much as 500% the cost to make products vs what they sell for on retail, has nerve to complain Qualcomm is charging to much. Maybe they are. If so, don't sign a contract. Either QC will lose customers because of it, or they won't. The problem is not their price of modems, it's the patent abuse. No one can make great modems since Qualcomm has so many patents and to make a good one, you would have to violate them. It’s actually the opposite. SD was trying to push the benchmarks but when it came to smoothness it was hands down Exynos. The Snapdragon GPUs, DSP, and ISP hands down have been beating the Exynos GPUs, DSP, and ISP. in benchmarks perhaps. Using the phones, its a night and day difference. The SD is horribly jerky. Bucky clearly you don't know what you are talking about. There are many Android smartphones that use the SD 835, and a lot of them that I use are not jerky. Clearly you never used a Pixel, Xperia, OnePlus, or a lot of others that would tell you that you are a liar. False. When I had a Note 12.2, the Snapdragon 805 model was better than the Exynos model, because the graphics were actually less jerky, but the Exynos version had better battery-life. On this site they benchmarked the 805 vs the Exynos 7. I believe the the Note 12.2 used the Exynos 5. https://wccftech.com/galaxy-note-4-snapdragon-vs-exynos/ When you look at the GPU benches, the 805 was still noticeably faster. Considering the Note 5 had a QHD display, while the Note 12.2 has a 12" display at 2560x1600. Since I tried both the Exynos Note 12.2 on ATT vs the VZW model which has the 8xx, I know for a fact the SD model has must smoother graphics, while the Exynos had better battery-life. GSMarena shows the Note 3 vs the Note 12.2https://www.gsmarena.com/samsung_galaxy_note_pro_12_2-review-1041p6.php The Note 12.2 with the SD, was the same chipset as the Note 3, and you cna see overall all the Note 3 hardware was better, even if only slightly.